Background and purpose Recent reports from our laboratory demonstrated the post-ischaemic expression profile of various matrix metalloproteinases (MMPs) in rats and the detrimental role of MMP-12 in post-stroke brain damage. We hypothesise that the post-stroke dysregulation of MMPs is similar across species and that genetic deletion of MMP-12 would not affect the post-stroke expression of other MMPs. We tested our hypothesis by determining the pre-ischaemic and post-ischaemic expression profile of MMPs in wild-type and MMP-12 knockout mice. Methods Focal cerebral ischaemia was induced in wild-type and MMP-12 knockout mice by middle cerebral artery occlusion procedure by insertion of a monofilament suture. One hour after ischaemia, reperfusion was initiated by removing the monofilament. One day after reperfusion, ischaemic brain tissues from various groups of mice were collected, and total RNA was isolated and subjected to cDNA synthesis followed by PCR analysis. Results Although the post-stroke expression profile of MMPs in the ischaemic brain of mice is different from rats, there is a clear species similarity in the expression of MMP-12, which was found to be predominantly upregulated in both species. 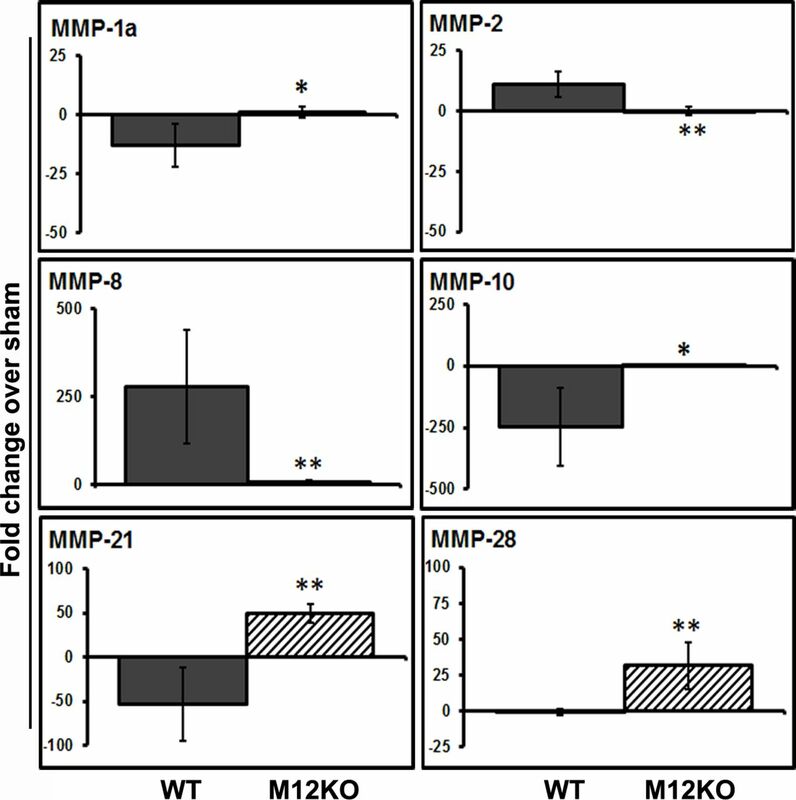 Further, the post-stroke induction or inhibition of various MMPs in MMP-12 knockout mice is different from their respective expression profile in wild-type mice. Moreover, the brain mRNA expression profile of various MMPs in MMP-12 knockout mice under normal conditions is also different to their expression in wild-type mice. Conclusions In the ischaemic brain, MMP-12 upregulates several fold higher than any other MMP. Mice derived with the genetic deletion of MMP-12 are constitutive and have altered MMP expression profile both under normal and ischaemic conditions. Because of the critical role various MMPs have on injury and during the recovery process after ischaemic stroke, investigating the post-stroke expression profile of all the known MMPs and understanding their contribution to the injury/recovery process would help the researchers to discover novel strategies to treat ischaemic stroke. We recently reported in a rat model the temporal expression profile of the majority of the known MMPs at various reperfusion times subsequent to a 2-hour focal cerebral ischaemia.10 We hypothesise that the post-stroke dysregulation of MMPs is similar across species. In this study, we tested our hypothesis by evaluating the post-stroke expression profile of these MMPs at 1-day reperfusion in a mouse model of ischaemic stroke. We also hypothesise that the genetic deletion of any MMP, for example MMP-12 in this study, would not affect the post-stroke expression of other MMPs. We tested our hypothesis by determining the pre-ischaemic and post-ischaemic expression profile of MMPs in wild-type as well as MMP-12 knockout mice. Our results indicated a predominant upregulation of MMP-12 in the ischaemic brain of mice. The degree of post-stroke induction of MMP-12 as compared with other MMPs in mice is in agreement with our recent findings in rats. The post-stroke expression of other MMPs except MMP-9 is different in mice and rats. Further, the genetic deletion of MMP-12 altered both the pre-ischaemic and post-ischaemic expression of MMPs compared with wild-type mice. The Institutional Animal Care and Use Committee (IACUC) of the University of Illinois College of Medicine at Peoria approved the study design, surgical manipulations, postoperative care and humane endpoints. All the procedures performed on animals complied with the approved IACUC protocol. Healthy, young male MMP-12 knockout (strain: B6.129X-Mmp12<tm1Sds>/J) and respective wild-type (strain: C57BL/6J) mice procured from the Jackson Laboratory (USA) were used in this study. Animals were housed in a 12-hour light/dark cycle with a controlled temperature and humidity and free access to food and water. All animal experiments were conducted in accordance with the Guide for the Care and Use of Laboratory Animals and the approved IACUC protocol. Mice were randomised to various groups. Middle cerebral artery occlusion (MCAO) subjected wild-type and MMP-12 knockout mice were from groups 2 and 4, respectively. Sham-operated wild-type and MMP-12 knockout mice were from groups 1 and 3, respectively. All animals from the four groups were euthanised 1 day post-MCAO procedure. Because of the mortality associated with the MCAO procedure, we increased the number of animals in each group to attain the required sample size for statistical analysis. Animals that did not show post-stroke symptoms after MCAO procedure were excluded from the study. After the animals reached a weight of ~23.5 g, they were subjected to right MCAO procedure by using a silicone rubber–coated monofilament suture (Doccol, California, USA). Briefly, a ventral midline incision (~15–20 mm) was made in the neck and the right common carotid, internal carotid and external carotid arteries were surgically exposed. The external carotid artery (ECA) was permanently ligated rostral with one ligature. Another loose ligature was made to the ECA near the bifurcation. Two microaneurysm clips were applied each to the common carotid artery (CCA) and internal carotid artery (ICA). A small puncture opening was made to the ECA between the two ligatures. The monofilament was inserted through the opening on ECA and advanced into ICA. The microaneurysm clip was removed from ICA, and the monofilament was gently further advanced into ICA up to 9 to 10 mm distance that is pre-marked on the monofilament. The other loose ligature was tightened around the ECA containing the monofilament. The microaneurysm clip on CCA was removed, and skin on the neck incision was closed with surgical wound clips. To restore the blood flow 1 hour after MCAO, the surgical site was reopened by removing the wound clips. The microaneurysm clip was again applied to CCA, the knot was loosened, the monofilament was withdrawn and the knot was re-tied to stop bleeding. The microaneurysm clip on CCA was removed and skin was sutured to close the neck incision. From the entire ipsilateral hemisphere of mice brains, total RNA was extracted using TRIzol reagent (Invitrogen, USA), reverse transcribed to cDNA with iScript cDNA synthesis kit (Bio-Rad Laboratories, USA) and used for real-time PCR analysis by using SYBR Green method. Briefly, reaction set-up for each cDNA sample was assembled using the FastStart SYBR Green Master (Roche, Indianapolis, Indiana, USA) as per the manufacturer’s instructions. Samples were subjected to 40 cycles at 95°C for 15 s, 60°C for 1 min and 72°C for 1 min in iCycler IQ (Multi Colour Real-Time PCR Detection System; Bio-Rad Laboratories, Hercules, California, USA). Data were collected and recorded using the iCycler IQ software (Bio-Rad Laboratories) and expressed as a function of the threshold cycle (Ct), which represents the number of cycles at which the fluorescent intensity of the SYBR Green dye is significantly above that of the background fluorescence. The genes and their respective forward and reverse primer sequences analysed by real-time PCR are listed in table 1. β-Actin served as a housekeeping gene. Average of Ct values were normalised with average Ct values of β-actin. After normalisation of the Ct values, fold differences were calculated by using the formula 2−(ΔCt of test)/2−(ΔCt of controls). To validate the changes in mRNA expression among groups, RT-PCR analysis was performed for certain genes such as MMP-12 and MMP-9 along with the housekeeping gene β-actin using GoTaq Green Master Mix (Promega) as per the manufacturer’s instructions. RT-PCR was set up in C1000 Touch Thermo cycler (Bio-Rad Laboratories) using the following PCR cycle: (95°C for 5 min (95°C for 30 s, 58°C–62°C for 45 s and 72°C for 45 s) × 35 cycles, and 72°C for 10 min). RT-PCR products were resolved on 2% agarose gels containing ethidium bromide, visualised and photographed under UV light. Statistical analysis of the data was performed using GraphPad Prism software (V.3.02). Quantitated data of PCR analysis were tested for normality and equality of variances between groups. The data that were normally distributed and have equal variances between groups were tested for differences by unpaired t-test. We applied Welch’s correction to unpaired t-test for the data that were normally distributed but has unequal variances between groups. Results are expressed as the mean±SD. Differences in the values were considered significant at P <0.05. 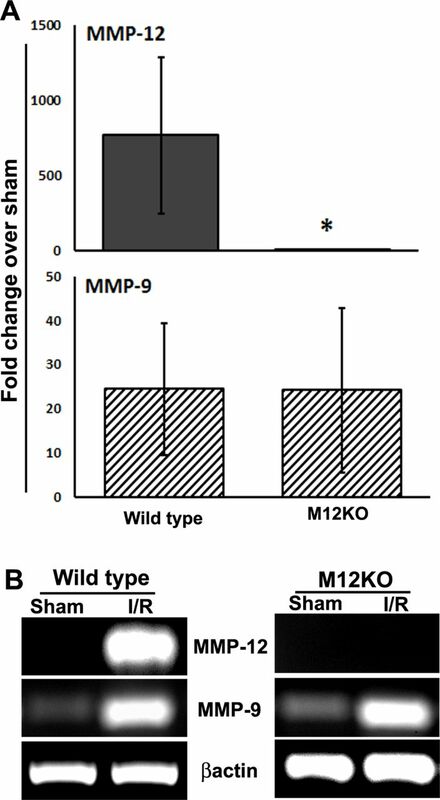 Our recent study demonstrated an upregulation (>10-fold vs sham) of MMP-3, MMP-9 and MMP-12 in ischaemic rat brains at 1 day reperfusion after a 2-hour focal cerebral ischaemia.10 Further, we noticed that the post-stroke induction of MMP-12 in rats was higher than any other MMPs tested. In contrast to the expression pattern that was previously reported in the ischaemic brain of rats, in this study, MMP-2, MMP-8, MMP-9 and MMP-12 were upregulated (>10-fold vs sham) and MMP-1a, MMP-10, MMP-15, MMP-16, MMP-17 and MMP-21 were downregulated (>10-fold vs sham) in the ischaemic brains of mice (table 2). Of all the MMPs tested, MMP-12 upregulation (~763-fold vs sham) was predominant in mice. Post-stroke induction of MMP-8 (~279-fold vs sham) in mice was the largest after MMP-12. Interestingly, marked downregulation of MMP-10 (~247-fold vs sham) expression was noticed in mice. There is no difference in the post-stroke expression of MMP-12 in the ischaemic brain of MMP-12 knockout mice as compared with their sham. As expected, significant upregulation in the post-stroke expression of MMP-12 was noticed in wild-type mice (figure 1A; unpaired t-test with Welch’s correction; Welch corrected t=3.608; P=0.0154, n=6). Genetic deletion of MMP-12 did not affect the post-stroke expression of MMP-9 (figure 1A, B). As mentioned earlier, marked upregulation of MMP-8 (~279-fold vs sham) and downregulation of MMP-10 (~247-fold vs sham) were noticed in wild-type mice subjected to 1-hour ischaemia followed by 1-day reperfusion (figure 2). Post-stroke expression of MMP-12 and MMP-9 in the ischaemic brain of wild-type and MMP-12 knockout mice. (A) Real-time PCR analysis of samples from the ischaemic brains of mice at 1 day after reperfusion subsequent to a 1-hour focal cerebral ischaemia. Histograms and error bars indicate the mean and the SD, respectively. n=6. *P<0.05 versus wild type. (B) Bands represent the mRNA expression of MMP-12 and MMP-9. Beta actin served as a loading control. I, ischaemia; M12KO, MMP-12 knockout mice; R, reperfusion. Dysregulation of MMPs in the ischaemic brain of wild-type and MMP-12 knockout mice. Real-time PCR analysis of samples from the ischaemic brains of mice at 1 day after reperfusion subsequent to a 1-hour focal cerebral ischaemia. Histograms and error bars indicate the mean and the SD, respectively. n=6. *P<0.05 vs wild type, **P<0.01 versus wild type. M12KO, MMP-12 knockout mice; WT, wild-type mice. Genetic deletion of MMP-12 in mice showed a significant difference as compared with wild-type mice in the post-stroke expression of several MMPs such as MMP-1a (figure 2; unpaired t-test with Welch’s correction; Welch corrected t=3.699; P=0.0140, n=6), MMP-2 (figure 2; unpaired t-test with Welch’s correction; Welch corrected t=5.062; P=0.0023, n=6), MMP-8 (figure 2; unpaired t-test with Welch’s correction; Welch corrected t=4.122; P=0.0092, n=6), MMP-10 (figure 2; unpaired t-test with Welch’s correction; Welch corrected t=3.812; P=0.0125, n=6), MMP-21 (figure 2; unpaired t-test with Welch’s correction; Welch corrected t=5.930; P=0.0019, n=6) and MMP-28 (figure 2; unpaired t-test with Welch’s correction; Welch corrected t=4.773; P=0.005, n=6). As mentioned earlier, MMP-15, MMP-16 and MMP-17 were downregulated (>10-fold vs sham) in the ischaemic brain of wild-type mice (table 2). Although the downregulation of MMP-15, MMP-16 and MMP-17 was prevented in MMP-12 knockout mice as compared with wild-type mice, the differences were not significant. As we noticed significant differences in the expression pattern of various MMPs in the ischaemic brain of wild-type and MMP-12 knockout mice that were subjected to 1-day reperfusion after 1-hour focal cerebral ischaemia, we tested the mRNA expression pattern of MMPs in these mice and under normal conditions. Our results showed that the expression of MMPs in MMP-12 knockout mice was different to their expression in wild-type mice. Except MMP-8, which showed an increased expression (~26-fold vs wild type), the expression of almost all the MMPs tested was less in MMP-12 knockout mice as compared to their expression level in wild-type mice under normal conditions (figure 3). Interestingly, the decrease in the mRNA expression of MMP-10, MMP-15, MMP-21 and MMP-28 was prominent (>50-fold vs wild type) and the decrease was more than the degree of reduction in MMP-12 mRNA expression in MMP-12 knockout mice. Alteration in the expression of matrix metalloproteinases (MMPs) under normal conditions in mice with genetic deletion of MMP-12. Real-time PCR analysis of the brain samples of healthy, young adult wild-type and MMP-12 knockout mice. Histograms and error bars indicate the mean and SD, respectively. In this study, we showed the post-stroke expression profile of various MMPs in mouse brain after focal cerebral ischaemia and reperfusion. We noticed that the induction or inhibition of MMPs in mice after ischaemic stroke was different to the expression pattern that we recently reported in rats.10 While comparing the expression pattern of MMPs in mice versus rats, we here discuss only the increasing or decreasing trend but not the degree of increase or decrease, as the induction time of ischaemia (1 hour in mice vs 2 hours in rats) in these rodent models is different. MMP-3, MMP-9 and MMP-12 were upregulated (>10-fold vs sham) and none of the MMPs tested were downregulated in rats.10 In contrast to rats, in this study, MMP-2, MMP-8, MMP-9 and MMP-12 were upregulated (>10-fold vs sham), whereas MMP-1a, MMP-10, MMP-15, MMP-16, MMP-17 and MMP-21 were downregulated (>10-fold vs sham) in mice. MMP-1, MMP-2, MMP-3, MMP-8, MMP-9, MMP-10 and MMP-13 proteins were upregulated in the ischaemic brain tissues of deceased patients who had an ischaemic stroke within the previous 4 days.8 The degree of severity of ischaemia and the presence or absence of reperfusion could be the possible reasons for the observed differences in the expression of MMPs in humans and rodent species. Most of the studies we discussed here in mice with genetic deletion of certain MMPs are in conventional knockout models (constitutive). The constitutive knockout of a target MMP is likely to result in the compensatory changes in these mice with altered expression of other MMPs. This further complicates the interpretation of the data that will be generated from these animal models. In this study, genetic deletion of MMP-12 prevented the post-stroke upregulation of MMP-12, MMP-2 and MMP-8 and downregulation of MMP-1a, MMP-10 and MMP-21, as well as upregulated MMP-28 as compared with wild-type mice. In fact, the genetic deletion of MMP-12 under normal conditions also resulted in the altered expression of several other MMPs. Our findings demonstrated that the MMP-12 knockout mice are not the suitable models to conclusively assess the role of MMP-12. It also raise the question of whether the same apply to other MMP deleted constitutive knockout mice. In summary, our results demonstrate the differences in the post-stroke expression of MMPs in the ischaemic brain. Of all the MMPs, MMP-12 upregulation is predominant in the ischaemic brain of both rodent species. Because of the compensatory changes, constitutive MMP knockout mice may not be the suitable models for confirmatory studies. We thank Mary Allyson Finger for assistance in manuscript format and review.
. Effects of matrix metalloproteinase-9 gene knock-out on morphological and motor outcomes after traumatic brain injury. J Neurosci 2000;20:7037–42.
. Effects of matrix metalloproteinase-9 gene knock-out on the proteolysis of blood–brain barrier and white matter components after cerebral ischemia. J Neurosci 2001;21:7724–32.
. Expression and localization of matrix metalloproteinase-12 in the aorta of cholesterol-fed rabbits: relationship to lesion development. Am J Pathol 1998;153:109–19. Contributors KKV was involved in the conception and hypotheses delineation, design and execution of the study, analysis and interpretation of results. KRN was involved in animal handling, postsurgical animal care, collection of tissues, conduct of PCR analysis, acquisition and quantification of the data, statistical analysis and manuscript preparation. BC induced ischaemia in animals. IBM and DNF assisted KRN in PCR analysis. AM and IV assisted KRN in agarose gel electrophoresis. JDK, DMP, KMB and KKV reviewed and edited the manuscript. Funding This work was supported by the Illinois Neurological Institute, OSF HealthCare Foundation. Ethics approval The Institutional Animal Care and Use Committee of the University of Illinois College of Medicine at Peoria. Provenance and peer review Commissioned by the CSA; externally peer reviewed. Data sharing statement The authors agree to provide upon request the unpublished data that include raw data, metadata and statistical analysis results for the purposes of reproducing the results.